Spending eight hours a day at work for a week can be very stressful. You need to take a break. Find a restful place that you will surely enjoy. Where else can you get this than going to a beach? In Nags Head, North Carolina, you will find good beaches that offer great entertainment and assure a happy vacation. Ever experienced taking a sun bath facing the wide blue ocean? Or have you ever eaten in a cottage that is well ventilated by the breeze going in and out of it? If not, you may want to repeat the refreshing experience and induce your appetite as you dine at Nags Head Pier House Restaurant. Pier House Restaurant is an oceanfront restaurant on the Outer Banks of North Carolina. You are not just going to enjoy the scene but you will also love the offerings of this oceanfront restaurant. With cool ocean breeze, and fresh foods at your disposal, who wouldn’t feel rejuvenated? You are also guaranteed of cooked seafood that is just fresh from the water. Come taste the savory natural flavor of fresh fish. Yes! Fresh fish indeed! You are invited to be the one to catch it. 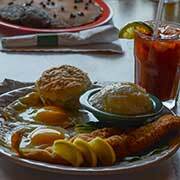 Catch a fish and the Nags Head Pier House Restaurant will cook it for you. Have a total relaxation experience at the Nags Head Pier House Restaurant with our great seafood and services. Since 1985, the Nags Head Pier House Restaurant has been providing such cool services for their customers. The main purpose is for you to have fun whether you’re local or on vacation. You can come anytime you feel. The Pier House Restaurant offers breakfast that is full of Outer Banks style, meals for your breezy lunch, and dinner with full entertainment that performs live at the Capt. Andy’s Oceanfront Tiki Bar and Grill. 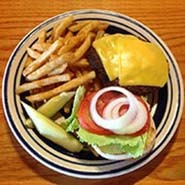 We also offer daily specials that you will surely enjoy. It doesn’t matter what time you come to the Nags Head Pier House Restaurant, we’ll serve you just as the sun rises until the cool hours at midnight. Play along the beach with your spouse and kids. This oceanfront restaurant will make room for you when you need nourishment after amusing game. And at night, after savoring the tanning heat of the sun, come and visit Capt. 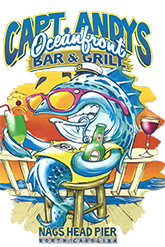 Andy’s Oceanfront Tiki Bar and Grill for a beer, wine, margaritas or frozen drinks and enjoy the night time live entertainment. The Pier House Restaurant and Capt. Andy’s Oceanfront Tiki Bar and Grill have been receiving positive reviews that you may be confident to try it for yourself. As an oceanfront restaurant on the Outer Banks, you will have the wide expanse of clear ocean water for refreshment and repose. Our great seafood will also bring you and your family to a time for bonding and invest in happy memories for life. 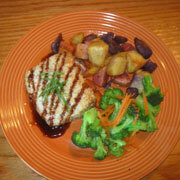 Whether you are alone or with friends or family, The Nags Head Pier House Restaurant and Capt. Andy’s Oceanfront Tiki Bar and Grill are suitable for your dinning and entertaining needs. Leave the stress and chores at home. Come and comfortably relax as you look out over the cool ocean waves and smell the freshness of ocean breeze. Join us for breakfast, lunch, dinner and live entertainment on the oceanfront tiki bar. 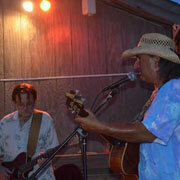 Oceanfront live entertainment starts at 7:00pm every night.